Chang Beer | Beers | International Beverage Holdings Ltd.
Chang Beer launched in 1995 and over the years it has not only become a drinking occasion favourite, but has also captured the hearts and taste buds of the Thai people. The pride of the nation, Chang stands for smiles, golden sunshine and sharing good times with friends. Chang is distributed throughout Asia and around the world. It is the fastest growing beer in Thailand and since 2015 has halved the gap on the brand leader. 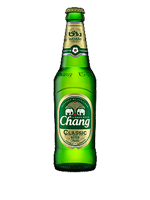 Chang Beer has a pleasant, full flavour with a subtle fruit and hop aroma, delivering a natural easy-to-drink brew. The barley specially selected for Chang has a low level of protein to give the lager its bright, golden clarity. The Chang Beer breweries are situated in areas of Thailand where there is an abundance of high quality water that is soft, low in mineral content and free from contaminants. The water is extracted from deep-water wells 200-300 metres below the ground. Chang Beer helps bring out the true balance of sour, sweet, bitter, salty and spicy in Thai cuisine.